1. No jobs are coming. 3. Oh, again, no jobs coming. I guess I just continue to lose money for another 4-5 days. Sounds like a perfect time for you to market for your company. I guessed wrong...2 calls for tomorrow. One of the problems with reputations is that the wrong people call. The 2 homes are located over an hour away and not normally considered, but since things have been so dead, I agreed. It is another lake community, but since it will likely be near 100 degrees, I am not hoping to find additional work while I am there this time. I am not even sure which machine I want to use with temperatures like that one? If I use the Butler, the interior will be unbearable for awhile on the drive home, but it would be cheaper than driving the box truck that far and I don't know how well I can regulate the heat on that TNT for furniture? 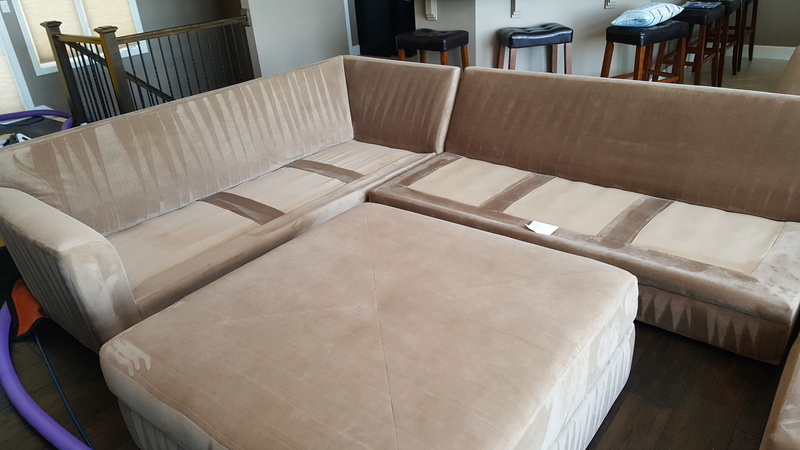 Shoot, they just added another sectional. It might be another long day, I better start stocking up on gatorade now. Don't forget a cooling towel. Those things just WORK. My first one was made by Frogg Togg, but Walmart carries towels too. A.thing that happens to me on severalmoccasions is that I think of 2 client that hasn't called me in a while or I know is due for a cleaning and bam! They call. I did 5 jobs today, all by myself, last 2 jobs were apartment, the last one was a pita, 3rd floor but almost like 4th floor, water spigot was down in the basement 160 feet away from the van. The cooling towel is a good idea, I do have a couple somewhere. I was thinking box truck as well, but the heat thing convinced me to go with the van. 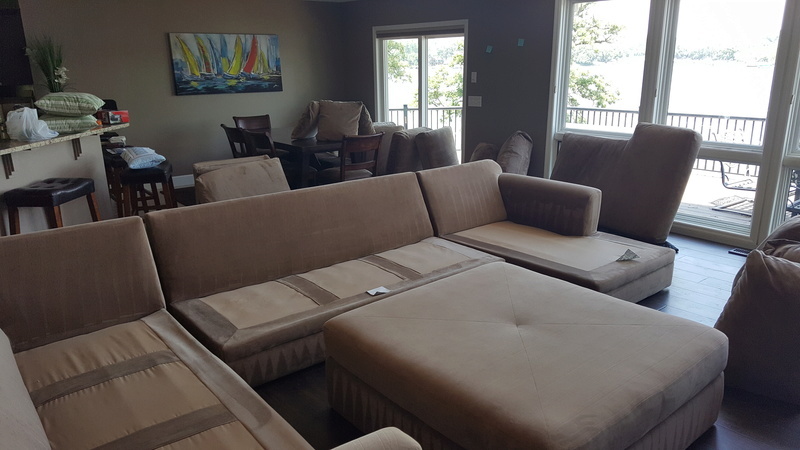 This job only includes 2 bedrooms, but 3-sectionals, so it really is an upholstery job. I think I will just hang at the lake afterwards until things cool down in the van. I have nothing else scheduled afterwards so I might just take it easy. Things were getting too slow for comfort, so this will at least stop the bleeding even though I waste a lot of time behind the windshield on this one. It will still be over $450 for what will likely be 2 hours worth of actual work. I guess the 2 hours in the seat will be tolerable. Ick, this job sucked from start to finish. It was bad enough watching people out enjoying the lake, but those sectionals were aircraft carriers....and micro-suede to boot so I had to go back and brush them out when I was done. Didn't enjoy this job at all. Each piece held 20 cushions / pillows and they all weighed about 5 lbs. each from the double stuffing inside. Where the hell do you stack 20 cushions to dry for pete's sake? The floor was hardwood as well, so it had lots of hazards to worry about. I was getting a pretty tight back after 3 of these bastards. 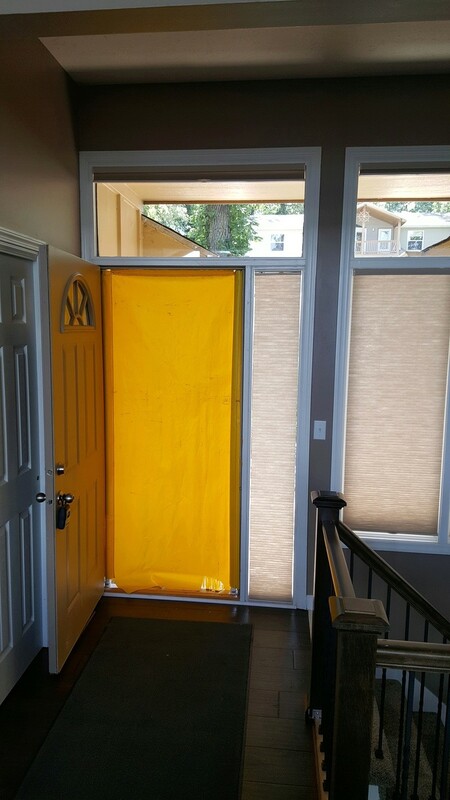 I did get to use the door seal for the first time on a hot summer day. I normally used it to keep pets under control, but this was the first 100 degree day....actually did a good job of keeping the cool air inside. I was pretty impressed. Oh, and I have to ask....WTH is this about? It was installed in the upper wall of the living room. I have never seen a cove like that before. Bob, the right side outlet looks like a coax cable outlet ? 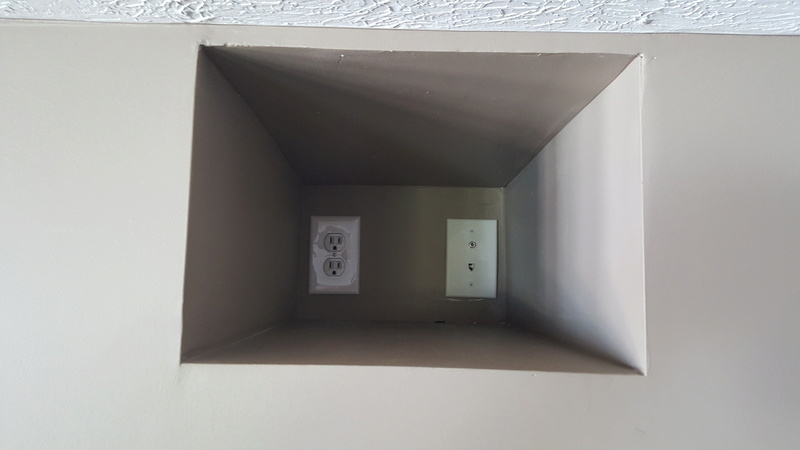 If it is then it's for TV, it's getting more common for new homes to have those installed so that no cable is shown when they mount their flat panel on the wall. Oh, I hadn't thought about a tv. Probably shouldn't be almost flush with the ceiling then. I just kept looking at it and scratching my head. @dp1 wrote: Bob, the right side outlet looks like a coax cable outlet ? If it is then it's for TV, it's getting more common for new homes to have those installed so that no cable is shown when they mount their flat panel on the wall. That actually looks pretty neet, why I haven't thought of it.